We’ve all done it. We say, “I’ll get control of my money someday.” Someday. Sure. It sounds nice at the time, and it’s how we eventually end up broke. Let’s flip the script and end up rich instead! My To Do list is horrifying. I have too many things that I think I’ll do next week or next month. So last February I started writing down the date that I entered the item onto my list. And guess what? I still have things on there from last February! A full year! It’s so hard to delete these things, because I want to believe I’ll do them. It’s wishful thinking. If I was going to do them, I’d have done them by now, right? But I keep telling myself they’ll be done some day because that lets me believe I will do them. In the meantime, my list continues to grow to overwhelming proportions. It’s the same thing with money. Saying, “I’ll get out of debt someday” allows you to feel like you’re making an effort. It allows you to believe you’ll actually do it. But will you? Or will your debt continue to overwhelm you? 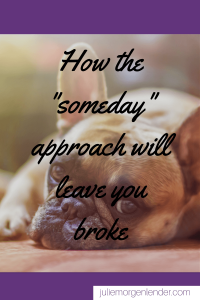 How has “someday” worked out for you so far? I’m guessing it hasn’t. Because “someday” doesn’t work. If it did, would you be reading this right now? If it worked, wouldn’t you be on your way to riches? 1) It might never get done. If you allow debt to pile up and savings to never be saved, guess how much you’re going to end up with? That’s right. Nada. Or worse than having nothing, you might owe money thanks to all that debt! 2) If it does get done, it won’t be now. When it comes to your money, you have no time to lose! The magic earning power of compound interest works in your favor only if you start early. And debt only gets worse with time, not better, as the interest continues to add up. Invest $500 per month starting today and you could be rich in a few decades when you want to retire. Wait until you’re 55 and it won’t be enough. Neither of these options is appealing. My to do list won’t fix itself. I’ve tried that approach. It totally doesn’t work. But it turns out, I can do it more easily than I’d realized, and the same will work for your money problems. Here’s a little riddle: What do you need before you have $1,000,000? Think about it: you can’t have millions without first having smaller amounts. You can’t get out of debt without first doing the teeniest tiniest little thing. So let’s do that thing. Think of it as your first dollar. Write down each tiny baby step of what you need to do to improve your finances. If you aren’t sure, look through this blog, but I’ll give you a few ideas in a minute, also. 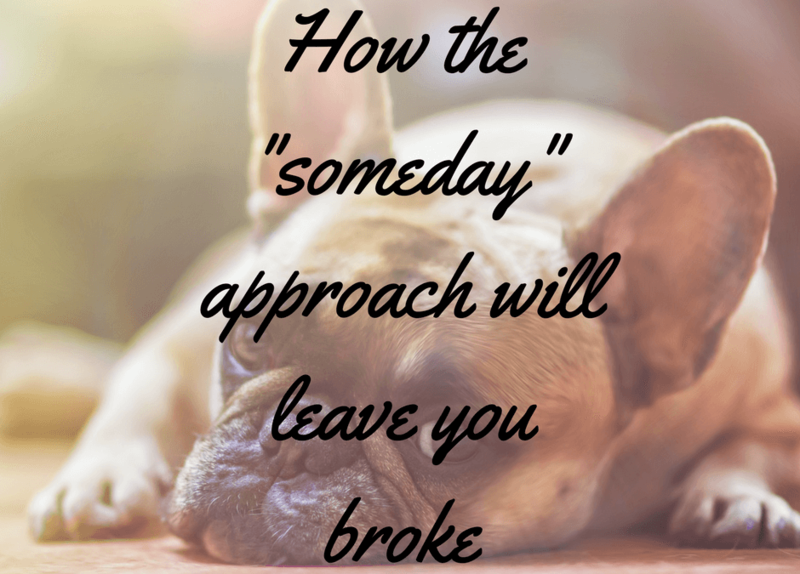 Don’t do this “someday,” do it today. Then schedule some time every day, just 10 minutes, to do that tiny baby step. In one year you’ll have taken 365 tiny baby steps and just think what a huge change that will make for your money! Remember, “someday” is not the same thing as having a plan. 10 minutes every day at 8am is a plan. Next Tuesday at 4pm is a plan. “Someday” is wishful thinking. Everyone’s baby steps are a bit different, but here are a few you can try, where each lettered item is a baby step. Remember, keep them small. Just 10 minutes per day. Then if you’re on a roll, you can feel free to do more than one in a day, but commit to doing at least one. a) List all of your debts. b) Review your bills and statements and make sure the list of debts is complete. c) Write down the amount owed and interest rate on each debt. 2) Get a basic emergency fund. a) Open a separate savings account. b) Gather up all of the loose change around the house and put it into the emergency fund account. c) Do some babysitting or dog walking or other work to earn some extra money for the emergency fund. d) Review last month’s credit card and debit card statements. Circle all expenses that can be cut back. e) Cut back in all areas possible and put the savings into the emergency fund account. f) Repeat steps (c) and (e) until you have $1000 in the basic emergency fund. b) Set up minimum payments on all but the smallest debt. Plan to pay extra on that smallest debt as much as possible. c) Repeat step (b) until all debts are paid off. These are just some examples. Make your own lists and make them thorough. Then do one step each day. For a while I did one thing from my to do list every morning before breakfast and it felt GREAT! I felt productive and happy before I’d really even started my day. And then I moved to a new apartment a couple months ago and my schedule got thrown off. I eventually got back into most of my routine, but not this part, and I regret it. That’s why starting tomorrow, I’ll be resuming the old habit of doing one item every morning before breakfast. Because it’s never too late to start again. And it’s never too late for you, either. For plenty of motivation and ideas of what to do next, sign up for the Nest Egg Chick emails! Every Monday I will send you a way to work towards crushing your debt and exploding your savings so that you can fund your dreams. Because in the end, that’s what I want for all of us.